You will save time and money on airport parking at Buffalo Niagara International Airport (airport code BUF). There are 6 options for parking at Buffalo airport. InstaParking and The Parking Spot area couple of examples. The Buffalo airport is in Cheektowaga in Erie County, New York. 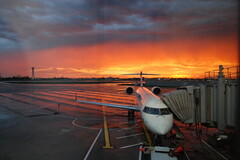 Although in the United States, the airport also serves southwest Ontario, Canada, with regular shuttle flights between Buffalo’s airport and Toronto Pearson airport. AirTran Airways, American Airlines, Continental Airlines, Delta Air Lines, JetBlue, Northwest Airlines, United Airlines and US Airways fly to Buffalo, with 110 daily flights. An in-airport, pre-security art gallery called ‘The Gallery – Where Buffalo Niagara shows off’ features rotating exhibits. The airport is home to a handful of places to grab food as well as a gift shop. For up-to-date traffic information, check out the NFTA website here. Taxi: Airport Taxi, ITA Taxi and a variety of other taxis serve the airport. Bus/Shuttle: The NFTA Metro lines of 204, 24, 30, 68 access the airport. Planning a long drive to or from the airport, or an odd-hours flight? Check out Buffalo Airport (BUF) park and sleep hotels. Don’t fancy driving to the airport? Or leaving your car there and paying for parking? Catch a shuttle to Buffalo airport.